I know, I know. It's not Christmastime yet. It's not even Halloween yet (even though it's only a couple of days away), but I wanted to try my hand at making these Yule Logs. Mind you, I've never even known what a yule log is. 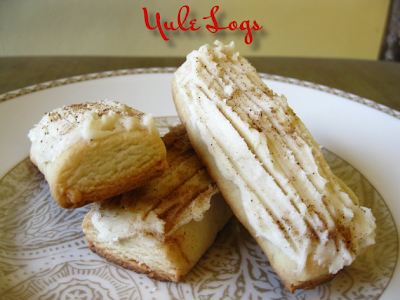 You see, yule logs aren't very traditional in Hispanic homes, so when I saw these interesting cookies, I had to try them out. I thought they were a bit too sweet for my taste, but my co-workers really liked them. They immediately said it reminded them of Christmas. According to The Ultimate Cookie Book, "Symbolic of a Yule log on a blazing fire, these sweet and spicy little cookies add to the warmth and fellowship of the season." 1) In a large mixing bowl beat butter with an electric mixer on medium to high speed for 30 seconds. Add granulated sugar, brown sugar, the 1/2 teaspoon ground nutmeg, and the ginger. Beat until combined, scraping sides of bowl occasionally. Beat in egg, rum, and vanilla until combined. Beat in as much of the flour as you can with the mixer. Stir in any remaining flour. Divide dough into six portions. Cover and chill dough about 30 minutes or until easy to handle. 2) Preheat oven to 350F. On a lightly floured surface, shape each portion of dough into a 1/2-inch-thick rope. Cut ropes into 3-inch logs. Place logs 2 inches apart on an ungreased cookie sheet. Bake 12 minutes or until light brown. Transfer cookies to a wire rack; cool. 3) Frost cooled cookies with Browned Butter Frosting. Run a fork through frosting lengthwise along log so frosting resembles bark. Sprinkle lightly with ground nutmeg. Let stand until set. In a small saucepan heat and stir 1/2 cup butter over medium-low heat until melted. Cook until butter turns golden brown. Remove from heat. In a medium mixing bowl combine 5 cups powdered sugar, 1/4 cup whole milk, and 2 teaspoons vanilla. Add browned butter. Beat with an electric mixer on low speed until combined. Beat on medium to high speed, adding enough milk (1 to 2 tablespoons) to make a frosting of spreading consistency. I'm planning on making one with Christmas. This recipe looks great! It uses dark rum; I love rum! Mmm they look great! :D I'm ready for Christmas! Quick question! Which "The Ultimate Cookie Book" did you use? I'm coming across quite a few! Paris Pastry: Rum and amaretto (sp) are my 2 favorite liquors to bake with!! Aden: Sorry I took so long to reply. The one that I used was the Better Homes and Gardens The Ultimate Cookie Book. Hope that helps!